Creating a market-leading brand name is not an easy thing to do but it is something that slots developer Novomatic has managed to do and one of the reasons for its success, in the European market in particular, is the fact they can include mobile titles such as Reel King in its portfolio. 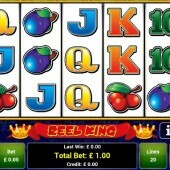 Reel King is a 5 reel, 20 payline slot that has a regal theme. The game has a kind of classic slots feel to it with the symbols across the reels consisting of cherries, melons, plums, bells, triple 7s, a jackpot symbol, and the regular 10-through-to-Ace symbols that you would expect to see on a classic slot machine. The Wild is also represented by a simple Wild icon. It substitutes for all other symbols on the reels to complete any potential winning combinations that might appear across the reels on any single spin. Now, this is where Reel King flips things on its head slightly. There are no standard Scatters on the reels that act as a trigger for a bonus feature. On Reel King, the bonus feature is actually randomly triggered so you will need to be on your toes at all times in preparation. Once triggered, a cartoon king character – whom we presume is the Reel King – will appear on any of the 5 reels. When he appears, he will create a mini-slot feature with his own special set of symbols and this will include guaranteed wins, whether you hit winning combinations or not. This bonus feature will only end when you don't hit a winning combination. It is possible to win up to 500x your total bet on this bonus feature. 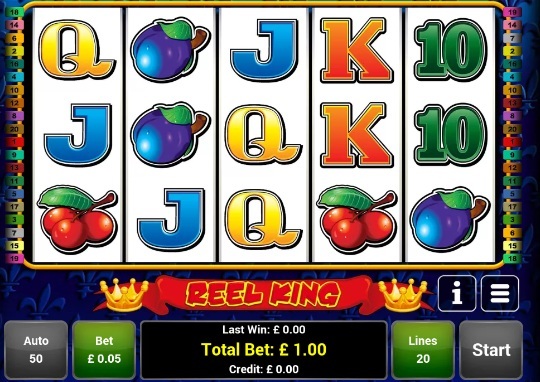 Reel King is one of the veteran slots on the market but it has stood the test of time. It is up there with the likes of Novomatic's very own Book of Ra Deluxe mobile slot and Barcrest's Irish-themed Rainbow Riches mobile slot. This mobile slot did also prove so popular that Novomatic launched a sequel title in the form of Rainbow King so check that out if you enjoy this slot.